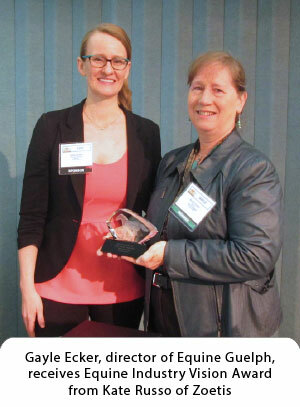 Gayle Ecker, director of Equine Guelph, has been awarded the prestigious Equine Industry Vision Award for 2015. The award, presented at the American Horse Publication Tally-Ho at the Alamo Seminar in San Antonio, Texas on Friday, June 19, 2015, recognizes Ecker’s innovation, vision and commitment to the equine industry. Sponsored by Zoetis, the award is intended not only to recognize outstanding leadership, creativity and service to the horse industry, but also to benefit the industry by inspiring these qualities in others. Equine Guelph, a not-for-profit Centre at the University of Guelph, Guelph, Ontario, serves the horse and its industry through education, research, healthcare promotion and industry development. Founded in 2003, Equine Guelph is supported and overseen by equine industry groups and is dedicated to improving the health and well-being of horses. Ecker received the distinction of being ‘short-listed’ for the Equine Industry Vision award from a record number of 25 nominees to one of four finalists. The other three finalists included: EQUUS Foundation, a charitable foundation providing financial support and services to equine charities across the United States; Jim McGarvey, Chairman of the Board, Back Country Horsemen of America; Juli S. Thorson, Editor-at-Large, Horse & Rider. The AHP Board of Directors, plus a Zoetis representative, select the award winner based on their performance related to their achievements, and demonstration of key attributes, including vision, innovation, leadership, commitment, dedication and willingness to serve, original and effective ideas, services, and programs, as well as high professional standards. Ecker has been with Equine Guelph since its inception, and played an instrumental role in its birth. She has dedicated her energies to advancing the equine industry through education and communications of research findings. Ecker and her team have been leaders in equine education, developing award-winning programs, including over 20 online courses supporting health and welfare, as well as courses in business development – all part of the Equine Studies Diploma. Another award-winning program, the popular “EquiMania!” has proven to be a favourite with youth and family. This interactive exhibit, promoting safety, welfare and career opportunities was a popular feature at the World Equestrian Games in 2010. Other feature programs include large animal technical rescue training, horse owner online tools, equine welfare assessment training, promotion of the new Equine Code of Practice and several other innovative programs.